Authentic Neolithic Artefacts from North Africa. NAN154 Neolithic Flint Arrowhead c.4000 B.C. 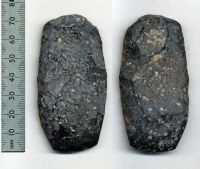 NAN150 Neolithic Stone Axe Head c.6000-4000 B.C. NAN149 Stone Hammer Head c.6000-4000 B.C. NAN136 Stone Axe Head c.6000-4000 B.C.